Cristiano Ronaldo left Buffon stranded with a stunning overhead kick for Real Madrid in the Champions League against Juventus last term. 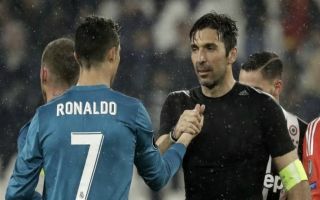 Gianluigi Buffon is one of the most well-respected and revered goalkeepers in world football, but in the Champions League quarter-finals back in April, he was helpless to stop Ronaldo scoring one of the best goals in European football history. The Portuguese superstar somehow managed to divert a Dani Carvajal cross into the net with his back to goal, showing amazing athleticism to connect with an outrageous first-time overhead volley. That wonder strike has been praised ever since, but new footage has emerged from the game which shows the great moment that Buffon acknowledged Ronaldo for his unstoppable effort. As Madrid’s all-time record goalscorer walked back towards the centre-circle, the Italian ‘keeper gave him a nod of appreciation and a thumbs up, which before now had gone unnoticed. Take a look at the video below via Twitter and revel in watching two greats of the modern game showing each other a great amount of respect, despite playing against each other on the biggest stage.